Gluten-free diets usually lead to grain free diets. However, eating more whole grain food is associated with less inflammation  and fewer infections as well as less cancer, cardiovascular disease, mortality from any cause, obesity, and type 2 diabetes. In addition, foods advertised as “gluten free” are usually very high in refined carbohydrates such as flours made from potato, rice, and tapioca. Unless you have a compelling reason (such as celiac disease) to avoid gluten, I recommend including minimally-processed whole grains (whole wheat, rye berries, whole hull-less barley, etc.) in your diet on a daily basis. The health benefits are inescapable; don’t get caught up in the gluten-free fad! However, I suggest avoiding products with ingredient lists that include added gluten, which always refers to refined gluten; naturally-occurring gluten will not be on the ingredient list. To read more about gluten see pages 40-41 of Good Food, Great Medicine (3rd edition). We talk about the health benefits of eating whole grains on pages 23-25 and why we all should avoid highly-refined grains on page 46. For many people antidepressant medications often have very limited benefit . However, two of the most powerful antidepressants available surprisingly don’t even need a prescription! 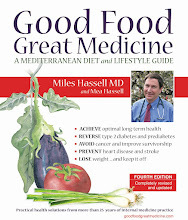 The Mediterranean diet has been shown to be effective for moderate to severe depression. In a recent randomized controlled trial, patients randomized to a Mediterranean diet (with red meat 3 to 4 times a week and red wine with meals) had a significantly greater remission of their depression than the control group  who received no dietary instruction. Exercise also has excellent antidepressant benefits, especially when outdoors in fresh air and natural light. Yet more evidence that the food and lifestyle choices we make each day are critically important for the health of our minds and our bodies! Eat a whole-food Mediterranean-style diet with plenty of vegetables, high-quality protein (including red meat), and good fat, but avoid refined carbs. Also, make room every day for some kind of outdoor exercise: a brisk walk, vigorous gardening, a flight or two of stairs – whatever you can manage.